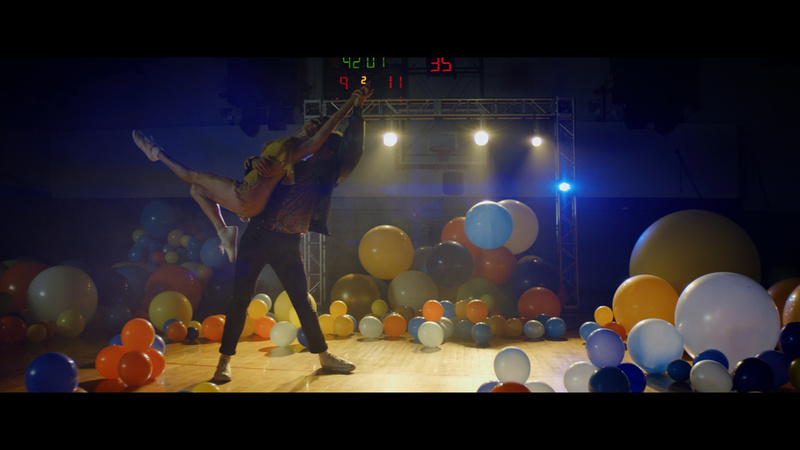 Justin Peck and Patricia Delgado in The National's "Dark Side of the Gym" video. Photo by Ezra Hurwitz, courtesy Peck. Last November, New York City Ballet resident choreographer Justin Peck and former Miami City Ballet principal Patricia Delgado masterfully took classical ballet to an entirely new medium in a haunting music video for The National's song "Dark Side of the Gym." In just five minutes, Peck (acting as both the video's choreographer and director) and Delgado—who are a couple in real life—told the story of a love that's not meant to last. (Ezra Hurwitz, a former MCB dancer, served as the film's producer and editor.) Using tight shots, the audience got to experience ballet through the smallest shift in facial expression, and it was magical—so magical that Peck has been nominated for a 2018 World Choreography Award. He and Delgado performed the piece on "The Tonight Show Starring Jimmy Fallon" last Monday, and tonight they're expanding on the video for a world premiere at New York City Center's Fall for Dance Festival. The original piece was set in a high school gym filled with hundreds of balloons, where the two dancers twisted effortlessly in and out of one another's embrace with the quick footwork and counterintuitive partnering that's customary of a Peck duet. Delgado's wounded eyes, yearning breaths and sheepish smile were matched only by her flawless technique and fluid movement, and the chemistry between the dancers was so tangible, it felt as though we had been invited into an intimate moment between them. If tonight's world premiere is anything like the breathtaking video, we're all in for quite the treat! We caught up with Delgado to get the inside scoop on their plans for the performance, and what it was like to dance together for the first time. What excites you most about this Fall for Dance performance? City Center has been wanting to get Justin to do something for Fall for Dance for a while, but he is so busy that they suggested we do the pas de deux from the music video for the stage. We both liked the idea because we had such a great experience with the "Dark Side of The Gym" video. When we made the music video, I don't think it was as important to Justin to create new steps. We pulled from stuff he had already done. Now that we are taking it to the stage, there is a lot of new material involved, which is impressive considering how busy Justin is. He loves to dance and it's really fun to see him get a chance to perform his own work because it's not often that he gets to do that. The music video was the first time we had ever danced together, and today will be our first live stage performance together. It's a really special piece for us and I'm super excited to perform it. How have you expanded on the video for the stage? We realized it needed to be longer. It wasn't enough of a piece on it's own, so we listened to the rest of the album and found the song, "Guilty Party." I didn't gravitate towards Justin's musical choices at first. I couldn't find the beats and melodies he was finding, and it was really challenging for me. Now that he's layered the choreography on top of the sound, I hear it so differently, and I'm obsessed with it. I'm really proud of what we've added to the piece. What about the work stands out to you ? Structurally, we've inverted the normal traditions of pas de deux. Instead of dancing together, then solos, then coda, we decided to dance separately to the same song. We never see each other during "Guilty Party." We just dance side by side, or one of us will run offstage at different times. Then we find our way together at the end for "Dark Side of the Gym." It's more abstract, with much less of a narrative than the video. The beauty of The National's music is that it's mysterious. There is an enigma to figuring out their music, and it isn't meant to have a storyline, but certain lyrics really trigger an emotion in me that I can relate to from past experiences. It's not the story of Justin and I at all, but I can go into a really beautiful emotional state where I explore what things were like before he was in my life. Peck and Delgado in a scene from "Dark Side of the Gym." Photo by Ezra Hurwitz, courtesy Peck. We met when he was commissioned to do a ballet for Miami City Ballet. I was injured at the time and was really bummed I couldn't dance because I would have loved the opportunity to work with him. But in the end it ended up being the best injury I've ever had because I was free to show him around Miami while he was there. We got to know each other in a non-professional setting, which was the best gift. Had we been working together those two weeks I would have gotten to know him in a different way because I would have been focused on dancing. I truly believe everything happens for a reason. To be super honest, I remember rehearsing for the video and thinking, "Wow, I'm getting into this dramatically more than he is. He isn't looking at me at all. Maybe, he's just focused on the steps or something?" I didn't know what his process was, and I was nervous. I wanted him to like the piece and enjoy dancing with me. On the day of the shoot we were on set from 11:00 am to 9:00 pm, nonstop. We had to keep doing sections over and over again, and there was a lot of stopping and starting that we weren't used to. In spite of that, it was amazing how much I was able to feel while dancing with him that day. I didn't get that experience in rehearsal, but I learned that the magic happens when you're performing. You've performed this piece in a concept video, on television and now onstage. What's it like to see it play out in so many mediums? It's so liberating, and it was the right order to do it in. It was very experimental and explorative for the music video. Then we had a wild ride Monday night on "The Tonight Show" —it was such an incredible opportunity but we had no control over anything. It was a slick, buffed floor on a super-small stage with cameras moving and zooming in and out. The circumstances have been exciting but challenging up until now. Performing this onstage will be like coming home.